This post was written for a group outing so it’s not a typical trail review. Lake Elmo Park Reserve has two multi-use trails suitable for novice trail biking (trail maps.pdf). The trails can also be used in winter for skijoring. Both trails have some horse traffic (see below) and can be ridden in both directions. They resemble old country roads. 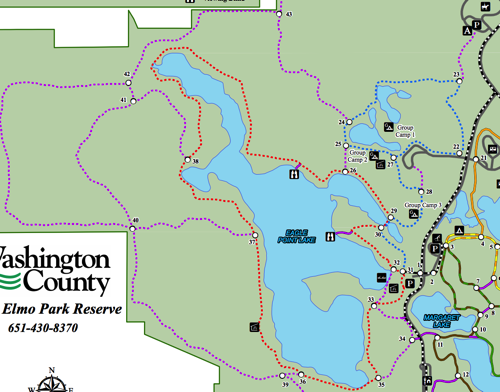 The Eagle Point Lake trail is a 3.8 mile loop (red trail below). It has a bit hillier and less shaded than Bluestem and has more horse traffic. There are areas where rainwater can collect. In addition to these two trails there are unnamed side trails (purple dashes on trail maps) that can significantly extend rides and connect loops. Grass is longer on these trails. There is a $7 vehicle fee ($30 a season). Helmet. Every rider needs a helmet including ride leaders, aides, etc. Bike: A mountain bikes best. A gravel, “cross” or “city” bike would work for a more expert rider who could manage bumpiness. Pass from in front: I think is best to stop pull over to the side and let horses pass. If need to cancel (Rain, Temp over 95F) will send to MNSH Group and will update Facebook Event. There is some horse poop but it’s not minor at this time in season. The trails we are on are not overgrown, but there are ticks in the taller grass. Consider spraying lower legs. When we come up on horses call ‘hello’ in a friendly voice, let rider move horse to the side. If approaching from the front pull over and let pass unless rider says otherwise.